For the longest time, London Square has just been a large office complex that I walked past on Guildford’s London Road, opposite London Road Station and Guildford High School. Not anymore. While I was flying around the world and swanning off to Manchester and Rome, Surrey Hills Coffee was busy opening a new branch, to go with this year’s relocation to Jeffries Passage. Not that you’d know from walking past on the street. The new Surrey Hills Coffee is in a container-style cabin in the car park, its back to the main entrance, facing the offices. It’s cosy looking, instantly reminding me of the Grindsmith Pod in Manchester, only with fewer windows. There are a couple of tables outside, which will come into their own during the warmer weather, while inside a pair of three-person bars provide the seating. 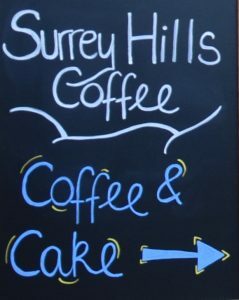 When it comes to coffee, the Holmbury Hill blend is on espresso, plus a range of cakes, snacks and, at lunchtime, soup and sandwiches/toasties. Even better, although the customers are primarily take-away, there are proper cups! For a long time, my home town of Guildford had been crying out for an independent, speciality coffee shop. 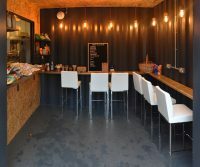 Then, two years ago, along came Surrey Hills Coffee, a local roaster which opened its own coffee shop on Chapel Street, taking over the lease from TurnFit Deli. These days, Surrey Hills has some good company, with Canopy Coffee opening last year and Krema Coffee coming along this year. However, the shop on Chapel Street was never ideal, effectively being someone else’s space, with a small, cramped layout. The owners, Monika and Chris, who roast all the coffee in a roastery in Forest Green in (you guessed it) the Surrey Hills, had been looking for a new, bigger home. Now they’ve found it, Surrey Hills moving just a few streets away to Jeffries Passage at the top of the High Street. The new shop is bright and spacious, with an upstairs as well, although that’s currently work-in-progress. Right now, Surrey Hills is up and running, with a basic coffee-and-cake offering (espresso, batch-brew filter and pour-over), along with the full retail range of coffee, although as things settle down, the plan is to serve breakfasts and light lunches too. Watch this space!